Have you ever tried making MORCON? 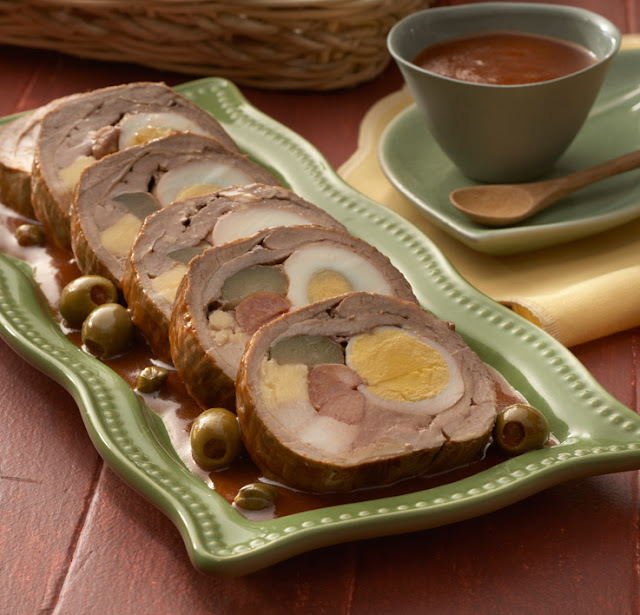 Wow your guests with this delicious dish perfect for special occasions! Add some grated cheddar or Quickmelt cheese to the morcon gravy for creamier dish. 1. Marinate beef for 2 hours in a mixture of garlic, calamansi juice, soy sauce and pepper. Keep chilled until ready to use. 2. Assembly: Lay out marinated beef and arrange slices of pork fat, beef liver, franks, sliced eggs, pickles, cheese and chorizo on the middle part of the beef. Roll like a log and secure by tying with a kitchen twine around the roll. 3. In a large pan, add oil and pan-fry the morcon roll until golden brown. Remove from pan and set aside. 4. Using the same pan with oil, sauté the garlic and onions. Add tomato sauce and bring to a boil. Add bay leaf and water. Bring mixture to a boil. Add back the morcon and simmer until morcon is fully cooked and tender, about 2-3 hours.